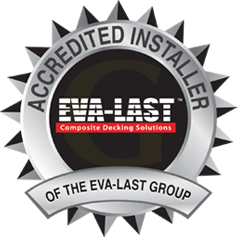 Maintenance of your new deck is of the utmost importance if you would like it to look as good as the day it was handed over to you. 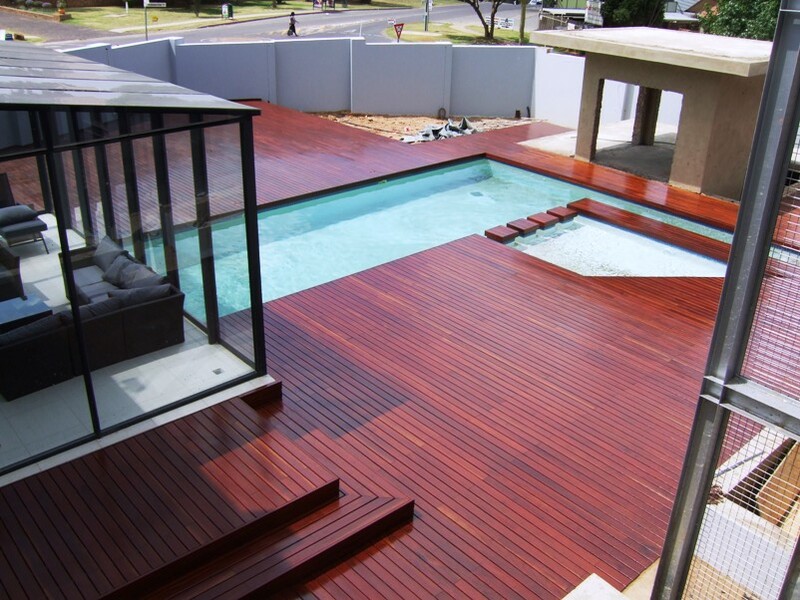 Decking is typically treated with penetrative oils or some form of sealer. The treatment/maintenance/re-treatment for oiled and sealed decks are considerably different, so please make sure you know what treatment is currently on your deck. We encourage you to think of your deck as beautiful wooden furniture - which it is. If you have ever had Teak or other wooden furniture which you use outside and is exposed to the elements, you will know how important it is to oil the furniture regularly in order to keep it looking as beautiful as that day you purchased it. Your deck is no different. So - the basics: Keep the deck clean. This means two things - firstly, make sure you keep your deck clear of leaves and other organic materials, especially those which build up between the planks. This organic matter will hold moisture and invite rot. Secondly, wash your deck regularly (weekly/forthnightly) with DeckWash - assuming you have elected a penetrative oil treatment for your deck. 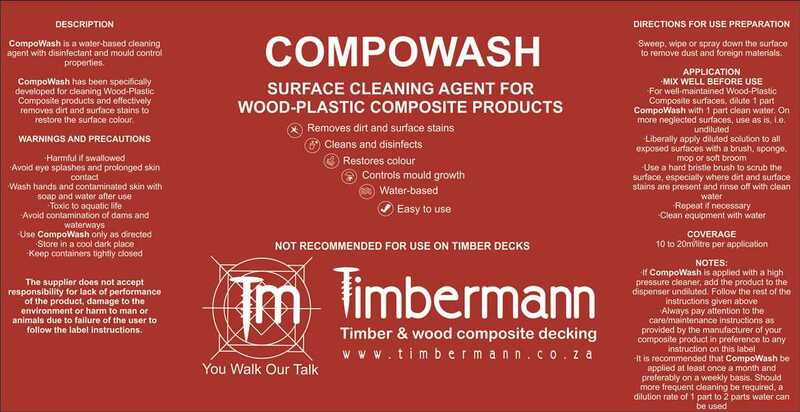 This product is specifically designed to be used with the treatments employed by Timbermann in the preparation of your timber. 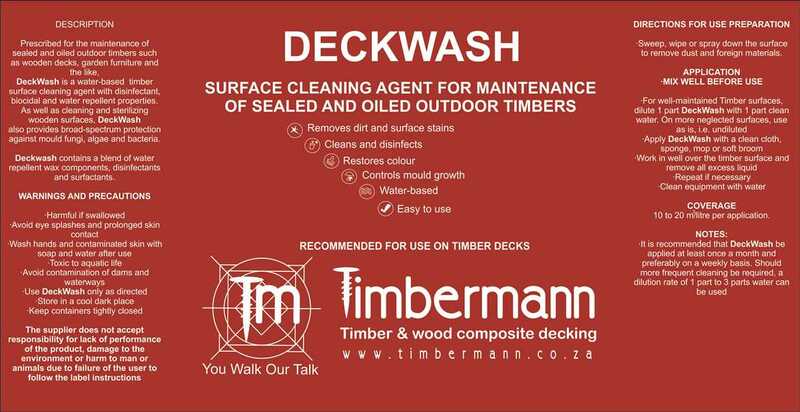 DeckWash will clean and sanitise your deck while feeding the timber with waxes. Regular use of DeckWash will prolong the time between re-oiling of your deck. 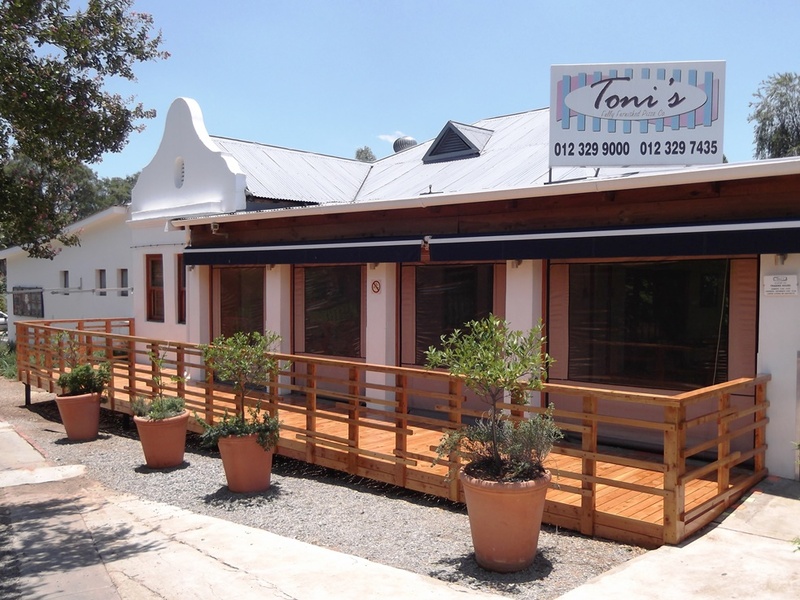 Re-oiling: Consult your installer as the which product was employed in the treatment of your timbers. It is recommended that you use the same product when re-treating your deck. 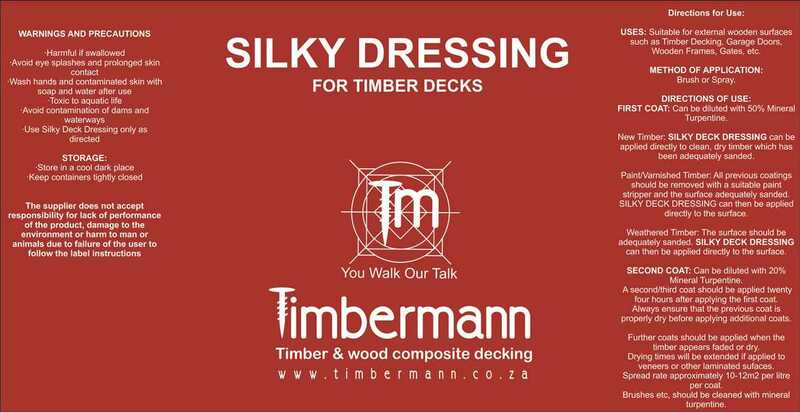 If you purchased your deck from Timbermann, we probably used Silky Deck Dressing. As a rule of thumb - the harder the wood, the more often treatment will be required. This is because the oils penetrate hard timbers only slightly, where as more porous timbers absorb more of the treatment. Re-oiling should be done whenever your deck begins to look dry and/or faded. On soft timbers, use a brush and apply a minimum of two generous layers of Silky Deck Dressing. On hard timber, use a brush and apply a minimum of two layers of Silky Deck Dressing for Hardwood Decks. Be sure not to apply too thick a layer per application. Regular schedule treatment of decks which Timbermann has installed using Silky Deck Dressing SHOULD NOT require sanding! Oils are designed to build up layers within the timber, and sanding removes all oils and the process has to start over. Do not treat your deck when rain is imminent. After re-applying oils, continue the following week with your Deckwash maintenance as before. 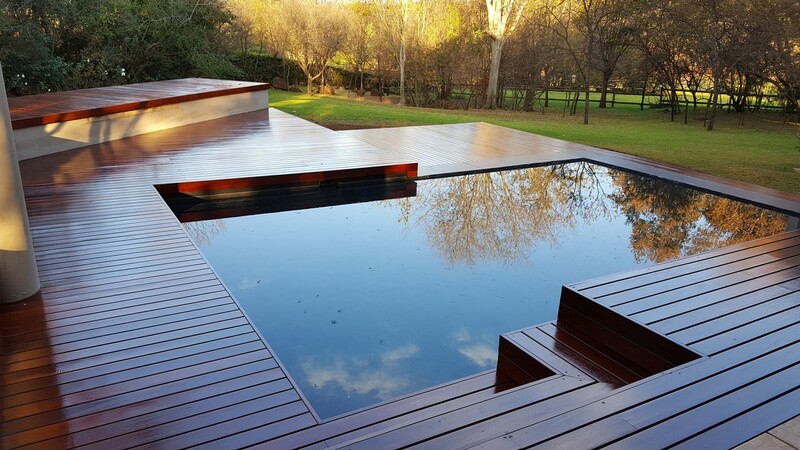 Please pay careful attention to the recommended maintenance - remember that your timber deck is a natural product and requires loving care if you want it to stay beautiful.